The stylish property offers a modern exterior and a contemporary interior with unobstructed sea views. There are a variety of luxury one, two & three bedroom suites all are unique in design and décor with first class fittings and facilities. Capital Coast Resort & Spa has been designed with the warmth and hospitality in mind that the island of Cyprus is renowned for. 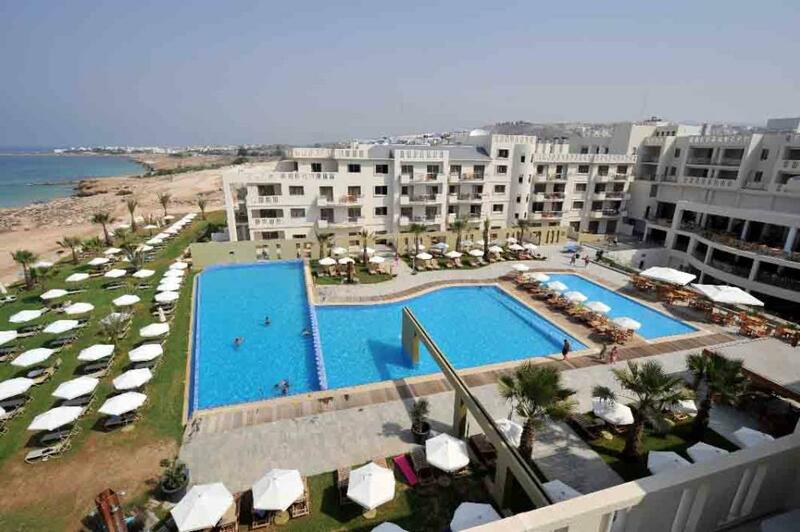 The resorts buoyant Mediterranean spirit captures all its guests, welcoming them to enjoy and relax amongst its excellent hospitality and services. At the Capital Coast Resort & Spa you will enjoy elegant classical modern exterior and spacious contemporary modern interiors that offer unobstructed sea views from within the resort and comfort from its furnishing and surroundings. 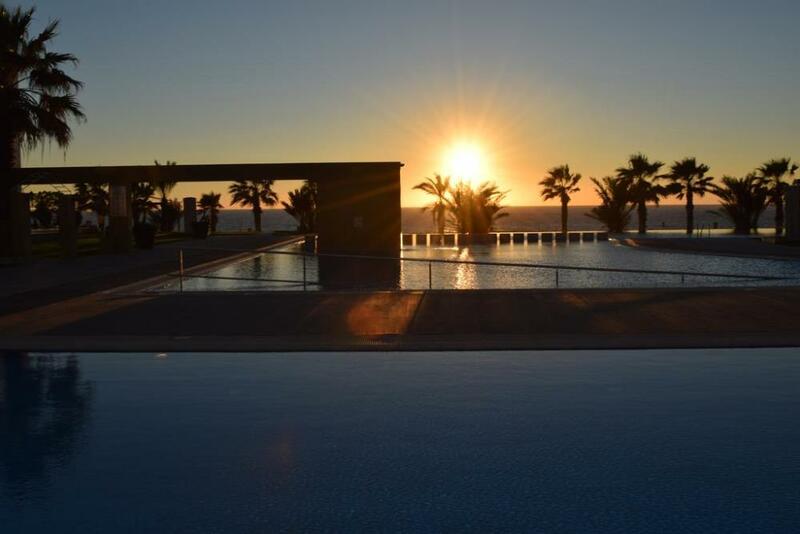 Onsite facilities include an a la carte restaurant, pool bar, evening entertainment, large outdoor swimming pool, onsite shopping facilities, and wellness and spa facilities. 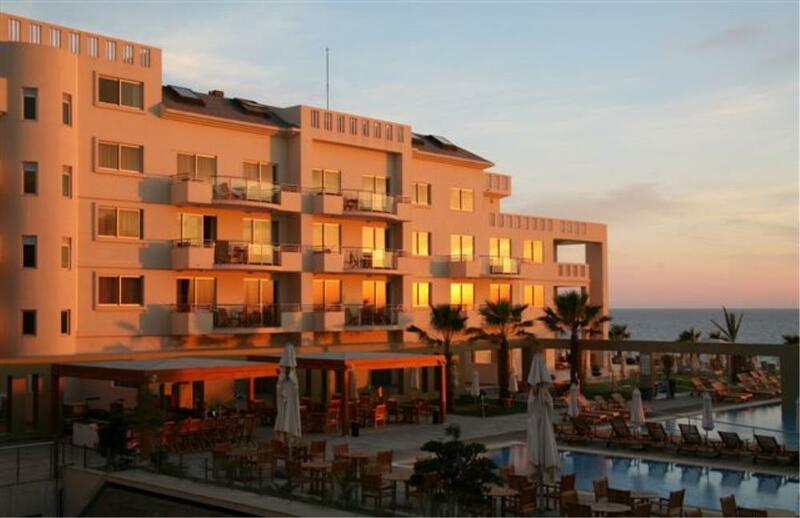 Perfectly positioned on the seafront overlooking the Mediterranean, guests can experience the beauty of the Cypriot sunset at the end of every relaxing day. The Capital Coast Resort & Spa offers a 24 hour reception service, on site shopping facilities, beautician & hairdressing salon, outdoor parking, secure underground parking, currency exchange, a mini market, Doctor on call, laundry & dry cleaning service, nursery and crèche facilities, baby changing facilities, pre booked baby sitting services and children’s meals. Guests should note, that all major credit cards are acceptable and the resort is licensed for weddings. A variety of very spacious high quality One, Two & Three Bedroom self catering suites are available all encompassing a contemporary light modern décor that captures the Mediterranean spirit. All suites are designed to offer a unique home away from home experience of comfort and luxury in a relaxing Mediterranean resort. 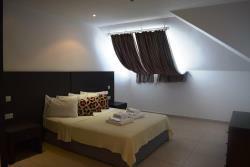 are situated on the top last floor as an attic room with skylight window, communal terrace and no balconies. There is no lift to the top floor. Studios have only Shower no Bath. Max. Occupancy: 2 persons. Very spacious high quality Superior self catering suites all encompassing a contemporary light modern décor that captures the Mediterranean spirit. All suites are designed to offer a unique home away from home experience of comfort and luxury in a relaxing Mediterranean resort. The One Bedroom Superior Suites consists of One Double Bed and the Two Bedroom Superior Suite consists of One Double Bed, Two Single Beds and One Sofa Bed. The suites have a CD/DVD player with mp3 connectivity. Baby cots are available on request. Very spacious high quality Executive self catering suites all encompassing a contemporary light modern décor that captures the Mediterranean spirit. The One, Two & Three Bedroom Executive Suites are larger and more spacious than Superior Suites. All suites are designed to offer a unique home away from home experience of comfort and luxury in a relaxing Mediterranean resort. The One Bedroom Executive Suites consists of One Double Bed, the Two Bedroom Executive Suite consists of One Double Bed & Two Single Beds and the Three Bedroom Executive Suite consists of Two Double Beds & Two Single Beds. All Suites have an additional Sofa Bed. The suites have a CD/DVD player with mp3 connectivity. Baby cots are available on request. Offering high quality, luxuriously and spacious Suites. 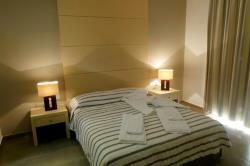 Guests can choose to have twin or double beds. The Two Bedroom Penthouse Suite consists of One Double Bed & Two Single Beds and the Three Bedroom Penthouse Suite consists of Two Double Beds & Two Single Beds. All Penthouse Suites have an additional Sofa Bed. The suites have a CD/DVD player with mp3 connectivity. Baby cots are available on request. 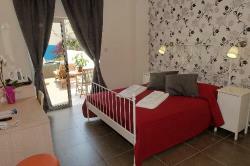 Very spacious high quality One Bedroom self catering Suites all encompassing a contemporary light modern décor that captures the Mediterranean spirit. All suites are designed to offer a unique home away from home experience of comfort and luxury in a relaxing Mediterranean resort. 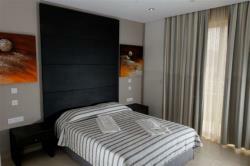 The One Bedroom Superior Promo Suites consists of One Double Bed. The suites have a CD/DVD player with mp3 connectivity. Baby cots are available on request. All Suites have an additional Sofa Bed. The supplement for the 3rd adult includes one free spa treatment. Children under 16 years are not allowed to use the spa facilities. Focusing on the areas of the body that you feel you need more relaxation or tension relief. Choose from relaxing or deep massage for: 1) Back Massage, 2) Back and Back of Legs, 3) Just Legs. Beautify your skin with a delectable bodyexfoliation using mineral salts with essential oils and finish with a light layer of moisturiser which will coat the skin with long lasting softness and suppleness. Suffering from tired aching heavy legs, this toning treatment offers an instant relief. Legs feel lightweight and are immersed in a feeling of lasting freshness and a pleasurable lightness. Discover the relaxing and healing effects of the Hammam Steam Room. Essential oils are infused in the air, as steam is absorbed in your pores, releasing built up stress and toxins leaving you feeling cleansed and balanced. rejuvenating soak in the sea. Rich in seaweed which is abundant in minerals, it replenishes, renews the body’s energies and aids in slimming leaving your skin as soft as silk. Feel your stress and tension melt away as you lay back in a bath with natural mineral crystals enriched with pure essential oils. Choose from calming lavender, refreshing mandarin or sensual ylang-ylang. The essential oils help to stimulate circulation, soothe muscles and nourish the skin. Our specially designed mini facial will leave your skin feeling radiant and alive. The perfect treatment for a quick pick me up! A soothing treatment to revitalize the delicate area around the eyes. With a blend of moisturizing ingredients to refresh, relax, firm and soothe the eye area. This replenishing treatment awakens the eye area, leaving the eyes brighter and more youthful. It helps to eliminate dark circles and puffiness giving the eyes a brighter sparkle, glint and shine. massaged. For the ultimate indulgence a glamorous classic polish to finish. For the active male, a complete manicure with exfoliation, paying close attention to your cuticle and nail-bed. A stress relieving massage and a nail buff to complete your treat. Brows are shaped and tinted to highlight your facial features. Eyelashes are tinted to show off those beautiful eyes! For hands and feet, nails are cared for and aclassic polish completes the treat. A dual action treatment for intensive moisture and for delaying the earl signs of ageing. The skin’s appearance is refined and the complexion appears smoother, more supple and moisturised. Men’s skin has its own special needs so we have designed a completely relaxing and rejuvenating facial just for Him, combining results and relaxation to replenish tone and firm the skin. A scalp, face and shoulder massage will relax, energise and revitalise the skin. The body is generously exfoliated and covered in a seaweed mask, drawing out its mineral rich concentration and powerful action to aid slimming. Minerals and trace elements boast the body’s metabolism, resulting in a slimmer feeling. An indulgent guilt free chocolate experience that’s not only tantalizing but aids in contouring the figure and boosts metabolism. Starting with a chocolate exfoliation, a divine detoxifying chocolate mud mask and finishing off this delightful experience with a revitalizing nourishing chocolate body lotion. Inspired by the Mediterranean fruit growing on the shores of Cyprus, you will begin with an invigorating Fruity Exfoliation, followed by a pampering creamy Fruit Envelopment. While your skin is being softened and smoothed relax and enjoy a multi-sensorial voyage on our floating bed. Last but not least a divine scalp massage will revive your mind, body and spirit. Your ritual begins by relaxing in a Rasul steam chamber, to cleanse your skin and remove toxins, preparing it for the cleansing scrub that follows. As you unwind on a warm Hammam bed gentle massage strokes with a dryloofah and scrubbing with your choice of one of our Mineral Body peelings and for the final touch an application of moisturizing cream. Skin is left feeling soft and glowing. A pampering foot delight, indulge in a refreshing aromatic footbath. Relax as your feet are buffed with a natural Scrub which smoothes the soles of your feet, followed by a conditioning foot mask that grants you a feeling of renewed freshness. Tired and aching feet are massaged and a glamorous classic polish to finish. Warm up and soothe painful muscles and joints throughout the body. A soothing exfoliation to prepare the skin, relieve aches and pains with a self heating seaweed applied to specific points throughout the body and finish off with a soothing cream application. The restaurant, located on the ground floor overlooking the Sea, serves international cuisine at affordable prices. First class chefs work endlessly to provide diverse and mouth-watering dishes from around the world. An abundance of waiting staff is also on hand, ensuring a high standard of service that is expected by our guests. The hotel offers either buffet or table d’hote dinners. The lounge bar, situated opposite the restaurant is the ideal setting for a night-cap after dinner. Live entertainment is on regularly and every kind of drink imaginable is on offer to accompany the unwinding atmosphere. The lounge bar terrace is the ultimate place to experience the beauty of the Cypriot sunset at the end of every relaxing day. The main bar opens at 3pm. With 2 pools (an outdoor and indoor),a children's pool, a gym with cardio-fitness activities, and a tennis court, the resort provides an array of in-house activities. Diving and snorkeling services are available at the nearby beach and a spa tub are on site. Other recreational amenities include a health club, a sauna, a steam room, and a fitness facility etc. 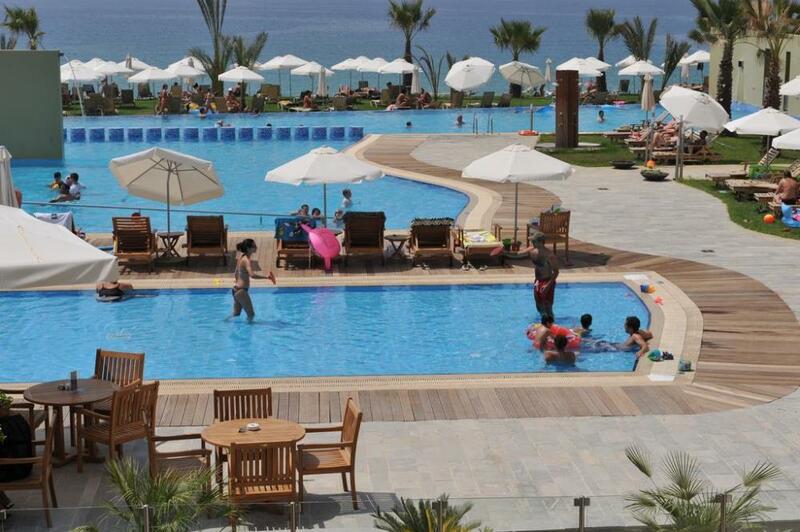 Some of the hotels facilities like the outdoor play area, the outdoor pool and the pool bar are seasonal facilities and can only be offered during the summer months weather permitting. 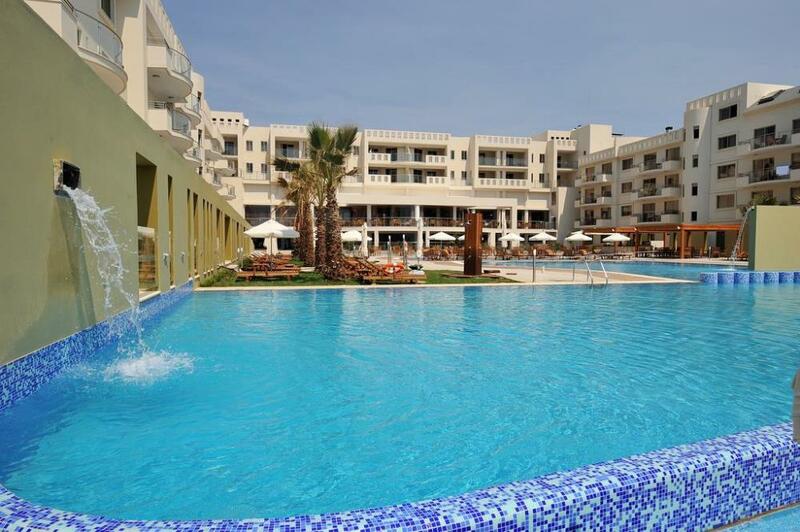 Capital Coast Resort & Spa is located in Pafos near the historic Tombs of the Kings, just a 20 minute transfer from Pafos International Airport. A nourishing treatment which enriches the driest of skins. The skin is plumped up restoring its softness, suppleness and vitality. Is a rebalancing treatment, ideal for combination to oily skin. Vital for dull complexions, the skin appears brighter, matt and fresh. Revive your skin with a boost of minerals, trace elements and vitamins forstressed, dull complexions. The skins appearance is renewed, refreshedand protected from external factors. It leaves skin looking fresh, healthy and glowing. Enhance your facial therapy with a reviving eye treat. Men's skin has its own special needs so we have designed a completely relaxing and rejuvenating facial just for him combining results and relaxation to replenish, tone and firm the skin. A scalp, face and shoulder massage will relax, energise and revitslise the skin. For the active male, a complete manicure with exfoliation, paying closeattention to your cuticle and nail-bed. A stress relieving massage and a nail buff to complete your treat. *Or try any of our Spa treatments and enjoy the many benefits. Inspired by the Mediterranean fruit growing on the shores of Cyprus, you will begin with an invigorating Fruity Exfoliation, followed by a pampering creamy Fruit Envelopment. While your skin is being softened and smoothed relax and enjoy a multi-sensorial voyage on our floating bed. Last but not Chleast a divine scalp massage will revive your mind, body and spirit. A full body renewing experience. A four hand journey of pure indulgence and tranquility with two therapists simultaneously performing a massage that flows over the body like a wave of serenity. Improve and combat circulation problems in the legs with the benefits of the sea combined with manual drainage actions for fluid retention. Help eliminate toxins and cellulite thereby refining the silouhette. An inclusive preventative and redefining treatment for restoring and restructuring the skins elasticity with specialized techniques and active ingredients. Designed to minimise the appearance of strech marks. An intensive anti-cellulite treatment with active ingredients exceptionally rich in marine and vegetable extracts. With the use of innovative sculting techniques the body contours are visibly redifined. Enhance your body therapy with a reviving eye treat. *Additional Exotic Destination treatments for the body to send you to magical lands and Sensory Journeys in our THali(sens insert. Ideal for after sports or to soothe aches and pains for comfort and relaxation. Relieve aches and pains with a warm soothing back, neck & shoulder therapy. A soothing exfoliation prepares the skin, a self heating seaweed mask to relax the muscles, and finish off with a soothing gentle back massage. Let yourself simply slip away into a world of complete relaxation and delight. Discover the relaxing and healing effects of the Hammam Steam Room. Essential oils are infused in the air as steam is absorbed in your pores, releasing built up stress and toxins leaving you feeling cleansed and balanced. This sumptuous ritual begins when you self apply our detoxifying mineral mud’s. As you daze at the stars and relax, scent infused steam gently fills the chamber drawing out the toxins from the body. After, a warm tropical rain pours down from the dome and as the mud is gently washed away, so is every last drop of tension in your soul. Your ritual begins by relaxing in a Rasul steam chamber, to cleanse your skin and remove toxins, preparing it for the cleansing scrub that follows. As you unwind on a warm Hammam bed gentle massage strokes with a dry loofah and scrubbing with your choice of one of our Mineral Body peelings and for the final touch an application of moisturizing cream. Skin is left feeling soft and glowing. A luxurious relaxing cleansing body ritual, begin by relaxing in the rasul steam chamber to cleanse and prepare the skin for the scrub that follows. As you unwind on a warm hammam bed gentle massage strokes with a dry loofah exfoliate the skin. Complete the ritual with a luxuriant unique olive oil soap full body and scalp massage. You left feeling warm, relaxed and glowing. Enhance your journey of relaxation by adding some private time to relax surrounded by soothing candlelight and calming music and enjoy a fruit or cheese platter and sparking water. A great opportunity for lovers, friends, mothers and daughters, fathers and sons, who would like to experience the nurturing and complete relaxation of a massage. As you lay side by side surrounded by soothing candlelight and calming music two masseures will treat you and and your massage partner to a delightful, soothing experience. Indulge yourself in our dream of a treatment. Begin with a warm aromatic mineral soak, followed by a natural hand peeling to soften the hands. Nails and cuticles are pampered and cared for, a luxurious hand mask is applied and as you relax your hands and arms are massaged. For the ultimate indulgence a glamorous classic polish to finish. Nurturing treatments... for treasured moments in life! Lay back and calm your senses in a luxurious hydro bath. skin as soft as silk. Immerse yourself in an ocean of mineral bath salts from the dead sea. Rich with seaweed extracts which will relax the body and soothe the mind as well as softening and revitalising the skin. For an ultimate bathing experience choose from revitalising apricot, purifying citrus blossom or calming lavender. Relax and unwind with a therapeutic hydrotherapy bath. An underwater hand held hose gently massages your body to help cleanse and improve your immune system, relieve stress and tension and soothe the body of aches and pains. Feel the warm water massage every inch of your body,while natural extracts condition your skin, mind and soul. For the ultimate indulgence, our bathing ritual begins with a luxurious soak in a hydrotherapy bath infused with natural mineral bath crystals and essential oils. After your mesmorising soak a full body relaxing massage follows easing out all the stress and tensions as you lay back and calm your senses. Discover your true beauty within. For a natural, elegant or sophisticated look. Expertly applied make-up for your special day, a natural, sophisticated orradiant look to enhance your features and natural beauty, including trial. Beautifully shaped eyebrows enhance your features and frame your face. Brows are shaped and tinted to highlight your facial features. Let us take your eyes on a journey back in time to renew and rejuvenate. This replenishing treatment awakens the eye area, leaving the eyes brighter and more youthful. Helps to eliminate dark circles and puffiness giving the eyes a brighter sparkle, glint and shine. *The perfect mini treatment to add on to one of our pampering facials. Pamper yourself with body refining and contouring treatments! Beautify your skin with a delectable body exfoliation using mineral salts with essential oils and finish with a light layer of moisturiser which will coat the skin with long lasting softness and suppleness . Relieve aches and pains with a warm soothing back, neck and shoulder therapy. A soothing exfoliation prepares the skin, a self heating seaweed mask to relax the muscles, and finish off with a soothing gentle back massage. Discover the relaxing and healing effects of the Hammam Steam Room. Essential oils are infused in the air, as steam is absorbed in your pores, releasing built up stress and toxins leaving you feeling ncleansed and balanced. This sumptuous ritual begins when you self apply our detoxifying mineral mud. As you daze at the stars and relax, scent infused steam gently fills the chamber drawing out the toxins from the body. After,a warm tropical rain pours down from the dome and as the mud is gently washed away, so is every last drop of tension in the soul! Back, Neck & Shoulders, or Back and Back of Legs, or Just Legs. Inspired by the Indian Head Massage this pearl of a treatment will embrace your mind and spirit. Aromatic oils used with a relaxing stress relieving head, neck and shoulder massage, aid in restoring strength and energy to the body while helping to balance inner and outer harmony. Relax and enjoy the soothing and moisturizing effects of this creamy seaweed and sea water bath which reproduces the benefits of a rejuvenating soak in the sea. Rich in seaweed which is abundant in minerals, it replenishes, renews the body’s energies and aids in slimming leaving your skin as soft as silk. Just a touch of glamour! An essential hand treatment to strengthen the nails and condition your skin. Put back all the moisture for silky, nourished and beautiful hands. Followed by nail file and a glamorous classic polish to finish. An absolute treat for your feet, exfoliation, aromatic foot soak and relaxing massage. Sooth, nourish and pamper your feet. Nail file and classic polish complete this treatment. For hands and feet, nails are cared for and a classic polish completes the treat. Indulge your skin with facials that offer optimum results, along with relaxation & calmness. Discover your true beauty within!